Display catchy promo banners on corresponding store pages to let customers be aware of all hot deals and specials you offer. Draw visitors' attention to specific products to trigger impulse purchases and increase an average order value. One of the most effective ways to squeeze more out of your promotional campaigns is to timely show relevant information to your target audience. As soon as native Magento functionality doesn’t allow creation of banners based on specific conditions, you need a flexible tool that will help you easily generate and wisely display promo banners to potential customers. With the Promo Banners for Magento 2 extension you'll be able to show banners on product, category and cart pages depending on specified conditions. Show banners based on product and cart attributes to stimulate customers buy more and increase your income. 3 banner types available: images, cms-blocks, HTML text. Possibility to add lists with products to all banner types. Display banners on product, category and any cms pages as well as in the shopping cart. Specify how many banners to show for the same position. Show banners depending on the shopping cart content. Place your promo banner in any place on the page. 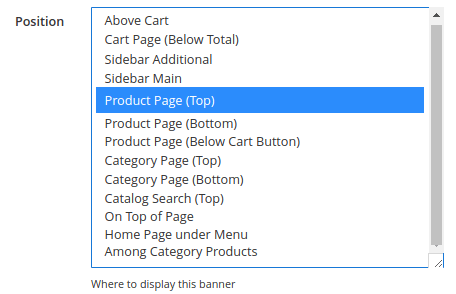 Select product categories for which each particular banner will be available. Display promo banners based on product attributes. E.g. show banners only on pages with Apple brand. Link banners to any page you need to let customers instantly find promoted products. Set dates and time for banner display. Display special offers based on search terms. With the extension you can display special offers on product, category and shopping cart pages. But for maximum customer engagement you need to make sure you've carefully chosen the banner's position. For this reason the module offers a rich list of page positions to make your promotions work. Create catchy banners using one of 3 banner types: images, CMS block or HTML text. Use a handy HTML editor to make your hot deals visually attractive. Make specials more relevant by adding the list of promo items to your HTML-, cms-block- or image based banners. This way customers will see all promoted products on one page and will more likely to add them to cart. The module lets you determine banners display by category. It's possible to select one or several categories for which you'd like to show your promotions. Apart from category pages your banner will be displayed on each product page assigned to the selected category. Promo banners can be shown when certain search terms are used by customers. Simply specify the necessary terms in your admin panel to make customers see promotions on corresponding pages with search results. To automatically remove outdated promotions from your store pages you can specify the time interval during which the banner will be demonstrated to customers. In case there are two or more banners meet specified display conditions they will be shown according to their priority. It's also possible to show only one banner with the highest priority. Don't miss the opportunity to promote your items on additional store pages like contacts or delivery page. Why not remind about a tempting offer once again and increase the chances of conversion? Make your promo campaign even more flexible and many-sided. Add your promo to already existing blocks to make the accents play a bit differently and highlight some items more sharply. Insert a specific piece of code - and you can place a banner into any CMS-block. Due to flexible module conditions an admin user can accurately fine tune the display of promo offers based on products added to cart. 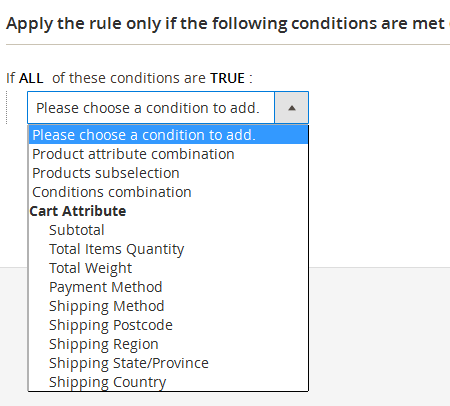 Create conditions based on cart attributes such as subtotal, products quantity, total weight, payment/shipping methods and many others. With the possibility to combine various conditions you'll definitely improve the efficiency of your promo campaigns by displaying highly relevant offers. If you offer a deal for a particular product or a group of products, it is necessary to display a banner on the corresponding product pages. With the advanced banner tool you can show hot deals based on product attributes, e.g. for all monitors with resolution 1920*1200. Improve the efficiency of your promo campaigns providing your customers with a selective access to your product catalog, try out our Magento 2 Customer Groups extension. We had a problem with displaying several banners on one page. now its ok again. In general good extension with many features. works well with custom themes. A nice module to improve the appearance of your webstore. No complaints, really. I like working with the ext. It helped to organize this work from adding various banners to different pages to choosing date and conditions for their display. I was looking for an easy solution to add banners to make advertisements more catchy and engaging. The good thing is that you can add banners to any place of the product page. Furthermore, all the options are very well compatible with my web store theme. – Improvement: now you can add banners to more places. – Improvement: code responsible for displaying banners grid in the admin panel was re-written with Magento UI components. – Fixed the products display on the sidebar position. – Fixed the issue with a drop-down for bundle products. – Fixed minor responsive design issues.